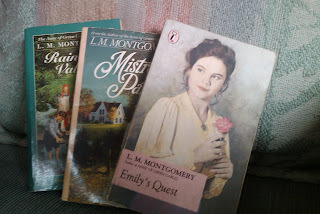 Some books can only be read by older, more mature people; others can be read only by a younger audience; some are specifically written for children; but the books by L. M. Montgomery are universal. They can be read by any age group. She is unique in being able to enchant all sorts of people. Of course the first book that comes to mind when mentioning L. M. Montgomery is Anne of Green Gables. The book is exquisite in its portrayal of Anne: an orphan girl, worked like a drudge in her childhood, but still managing to see the beauty of life. In Anne, we see the true optimist, who despite all odds manages to bring joy to herself and others in her life as well. I’ve never read about a heroine like her. As Mark Twain says Anne of Green Gables is the ‘sweetest creation of child life yet written.’ The book brings with it a freshness that is lacking in other novels. We have love, friendship, heartache and extreme happiness in the book. Laughter is common and the thing about L. M. Montgomery is that we can actually relate to everything in the book. Anne is a unique child and it’s obvious that we all want to be like her. We all want to have that same joyous nature, to be able to love intensely and see only the beauty even through the sorrow. L. M. Montgomery portrays a young girl living in an imperfect world able to see its perfections. Anne is by no means an angel. She has a quick temper. As Mrs. Rachel Lynde says, ‘Her temper matches her hair’, which is red. Throughout the Anne series we see Anne’s obsession with her hair, at one point even dyeing it green! She makes her fair share of blunders and mistakes but always learns her lesson. In her love life she, like most of L. M. Montgomery’s heroines, realizes much later than the hero that she is in love. With Anne, Gilbert actually almost has to die to get her to notice! Most of the time I hate reading descriptions of scenery in novels, but with L. M. Montgomery, I savor each and every word. Her words seem to bring out the best parts in everything. The snow, the flowers, sunsets and moonrises all have a different flavor when she describes them. And her genius at coining names for places! ‘Glimmer-glass’, ‘Idlewild’, ‘The White Way of Delight’, ‘The Fairies’ Mirror’. I just don’t know how she comes up with them. What else can I say about L. M. Montgomery? She was a great artist. Each and every one of her novels is a piece of art. Anne of Green Gables is of course her masterpiece; the novel that led to her fame. But she didn’t just leave with one great book. She has written many great novels and my personal favorite is the Emily Series. The series is also said to be autobiographical. Other good books by Montgomery are the Pat series and Jane of Lantern Hill. She’s also written many short stories and poetry. This is my favorite topic: discussing Anne and Emily and Pat:). All her heroines are distinct from each other. Anne is the sweet one who has ambitions, but puts her loved ones first. Emily is also ambitious but has a LOT of pride and, at least in the beginning, would sacrifice anything for her work. Pat is the most different; she has no ambitions except living in Silver Bush and keeping house. But they also have many things in common: they are all great lovers of beauty, they aren’t typically beautiful but have ‘personality’. Emily, unlike Pat and Anne, is not blind to her love for Teddy. I can go on comparing the heroines forever, but I’ll leave off. Till next time:). i have never been a fan of reading books or novels but i think after this ^^^ i am going to have to give it a try! Aleena - I love your comment! I am so glad that there are more people out there who love Anne and want to share their experiences of reading various novels!